The Pew Environment Group has collected over two thousand signatures from scientists around the world to urge the protection of the arctic region fisheries. The particular problem that has caused this petition is due to permanent sea ice loss which has opened up some unregulated areas of the Central Arctic Ocean. Without any protection, the international fishing industry could go unchecked and diminish the previously guarded fishing area. Sixty seven countries are represented in the petition, with scientists encouraging the development of an international agreement that will prohibit the commercial fishing of the area until research can offer additional management procedures. Of those countries that were represented, more than sixty percent of the scientists are from the five countries in the Arctic coastal areas: The United States, Canada, Norway, Russia and Greenland/Denmark. 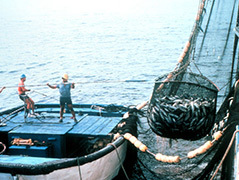 The three main recommendations for the protection involve: Development of precautionary management accord within the international fisheries. Beginning with a zero catch level until the results are completed of research on the impact of the Central Arctic ecosystem fisheries. Establishing an aggressive monitoring, management and enforcement set up before any commercial fishing will be allowed. The reason for all of this concern has been demonstrated within the history of unregulated commercial fishing. The Atlantic area of Canada, even though outside of the normally acceptable two hundred mile limit, proved devastating. In this case, while industrial and commercial fishing has not started in the northern part of the Arctic, these new waters are physically closer to many of the Asian ports than the waters of Antarctica. The larger bottom trawlers place stress on populations of toothfish and krill through over fishing and thereby upsetting the ecological balance of not only the area, but the entire food chain itself. The newest maps are showing that the permanent sea ice loss is opening up around forty percent of this incredibly pristine area, and it doesn’t look like it’s going to either slow down or stop. This is the first time in history that the area is available for industrial fishing, and scientists do not want to see an unregulated process wreak havoc on the area. While Canada and The United States make up the largest percentage of signatures for the petition, it is felt that Canada may take the lead in establishing the necessary procedures and guidelines. The campaign, spearheaded by the Pew Environment Group will work with countries in the Arctic regions, along with the fishing industry, scientist and the indigenous people of the area to attain and expand support for this agreement. It will be a main guide in the protection of international waters in the Central Arctic Ocean and protect the living marine resources from unregulated, premature or unsustainable industrial and commercial fishing. It is refreshing to see that a more global effort is being made, with a priority level attention on these previously unopened areas. It has already been proven that overfishing can cause devastation on the eco-balance of the world, and these initial steps can assist all participants as well as the earth. Posted on June 27th under Global Ecology.